» Compatible with Joomla! 3.x! 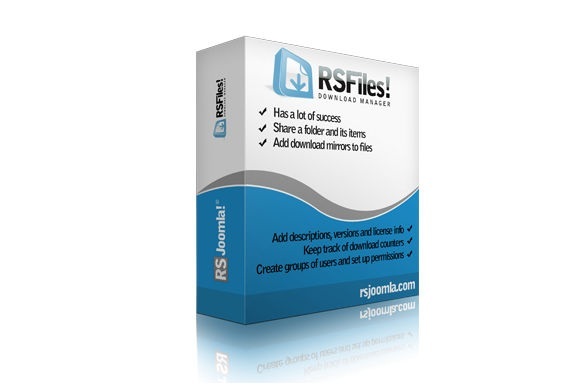 » Easily add files by uploading multiple files at once! » Group restrictions - choose which Joomla! groups have access, what they are permitted to do and where. » Briefcase - allow individual users to upload & download their own documents. » Responsive layouts, powered by Bootstrap! » Front-end maintenance - no need to give your managers back-end access. They will be able to add, delete and edit files straight from the front-end. » Set download limits per files. » Download by email - force your visitors to supply an email address in order to download the file. » Mirrors - for each file you can define a set of mirros. » Set your own custom download folder. » Secure the download folder with a .htaccess that prevents people from linking directly to your documents! » CAPTCHA and ReCAPTCHA spam prevention methods are supported! » Emails can be sent when a file is downloaded, uploaded, reported (eg. broken links). » RSMail! - automatically subscribe to a mailing list when the user inputs his email address to download a file. » Joomla! Search Plugin - allows a visitor to find files when using the Joomla! search. » Latest files - display a list of the latest files. » Folder content viewer - display files or folders from a pre-configured path.